I'm up really late and should be getting a few things ready for school tomorrow. I was so busy last week I didn't have time to finish the lesson I'm teaching tomorrow. I don't teach it until sixth period tomorrow though, so I can probably get everything ready during the day...but should be doing it tonight. Instead, I'm wide awake from the nap I took this afternoon and still procrastinating. So here's another post to add to the weekend updates. On Saturday, I set off in search of fall colors. I just started tutoring a student this week who is a training to become a monk at the local temple. Apparently it's a branch of one of the main temples in Japan. I had been there only one time during cherry blossom season, but didn't get to fully explore the grounds. After tutoring him last week (which was basically having an hour and half conversation with him), I decided that it would be the location for my leaf search. 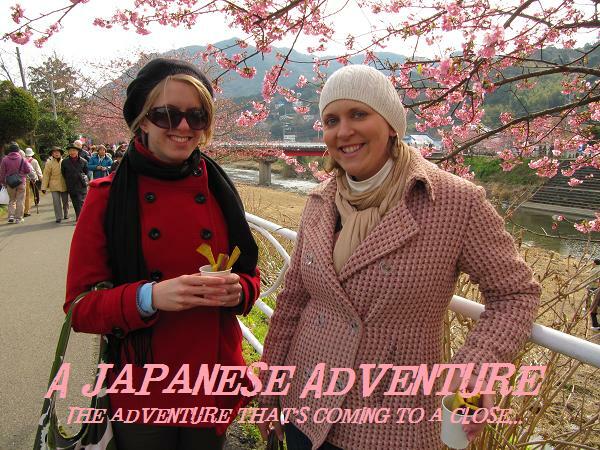 Colin, a Canadian who is working part time in Fuji, joined me for the adventure, and what an adventure it was (that's a tid bit of sarcasm, in case you couldn't tell). We did however, capture some good images (on our cameras, and in our hearts). All joking aside, I did get some cool pictures of Mt. Fuji. There is snow on top now, and the weather continues to get clearer as rainy season has faded away. We actually didn't find a whole lot of trees that were changing colors. There were lots of evergreens that were partially dying, though we decided the brown didn't count as fall colors. We did catch sight of Mt. Fuji at one point with a few trees by the side of the road. Every temple has a five story pagoda in Japan, and each story stands for one of the five elements. Here I was testing out the color accent feature on my camera. Thought it was pretty cool. After exploring the temple, we moved on to the other local hangout, JUSCO. It's sorta like the mall in Fujinomiya. Whenever I ask my students what they are going to do on the weekend, they seem to always say, "study." That is probably partially true for my students, but I find it hard to believe it's all the ever do. Some of my students have started telling me other things, and going to JUSCO is the most common answer I get. I actually do see my students there pretty often, so it must be true. We finished the day off at Kappazushi, the conveyor belt sushi place with the shinkansen that brings your special orders. A few weeks ago, we saw some people take down the touch ordering screen. Dion, Neil and I decided that we should try to do it too. I took it out of the plastic holder, but decided that it looked too much like a power cord and that we shouldn't unplug it. Dion and Neil weren't ready to give up, so Neil pulled the cord and the screen went black! We tried to plug it back in, but that restarted the whole thing and it came up with the regular computer start menu and we couldn't get back to the ordering screen. Dion had to swallow his pride and go tell the workers that "Uh....our ordering screen isn't working, I don't know what h appened." We ended up moving tables and it took 3 of the workers including a manager to get the thing working again. Needless to say, we'd learned our lesson and thought we dreamed it up that we had seen others do the same thing. Well, on Saturday, Colin and I saw the table across from us had taken down their screen! I was in shock. We didn't know what to do. Should we chance it again and risk embarrassment? In the true spirit of adventure and discovery, we decided to test out the theory one more time. With a watchful eye on the staff person near us, Colin bravely pulled the cord to the ordering screen and Voila! It turns out you CAN take down the ordering screen. What an adventure. Check out the rest of the fall pictures here.